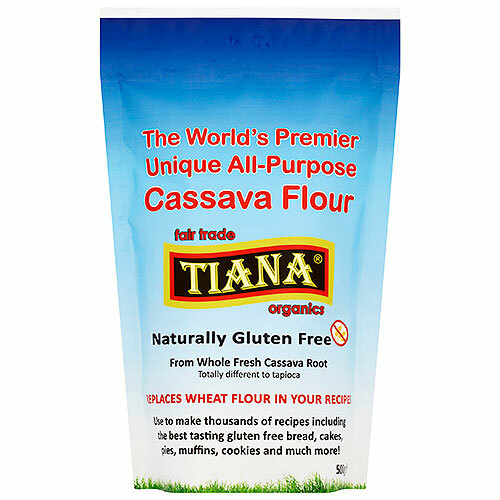 TIANA Fair Trade Organics All-Purpose Cassava Baking Flour is gluten-free, grain-free, nut-free and ethnically produced from premium whole fresh cassava that is totally different to tapioca flour. Cassava flour is made from the whole root and is an ideal substitute for all recipes using wheat flour. 100% Pure, with natural white colour, mild and neutral in flavour TIANA Wholesome All-Purpose Cassava Flour feels and looks like regular wheat flour. Premium quality, produced by an innovative bio-technological method using state of the art manufacturing equipment. For making gluten free bread, cakes, pies, muffins & cookies. 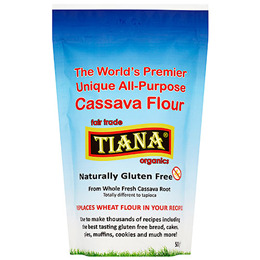 Below are reviews of TIANA All-Purpose Gluten Free Cassava Flour - 500g by bodykind customers. If you have tried this product we'd love to hear what you think so please leave a review. Good product, makes good bakes - you need less than traditional flour.